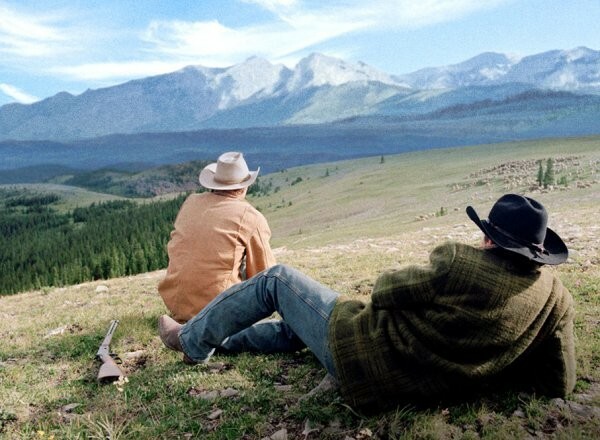 It's been a long time since I've allowed myself to watch BROKEBACK MOUNTAIN (2005), one of the most moving and beautifully told stories ever brought to the screen. The initial shock of sadness I felt at the end of the film never quite leaves me and I suppose I'm not anxious to live through it again. Added to it, of course, is the very untimely death of one of the young stars, Heath Ledger, a relatively short while later. Somehow the real-life tragedy incorporated the fictional and the two events became hard to separate in my heart and mind. Back then though, I was mesmerized and did see the film several times in some futile attempt, I suppose, to magically change the outcome. I so wanted that film to have a happy ending even when I knew it couldn't. Annie Proulx, the Pulitzer Prize winning author of the heart-wounding short story on which the movie is based, mentioned at one point how difficult BROKEBACK was for her to write and conclude because she'd set her characters up for tragedy. (I paraphrase.) According to her, there could have been no other ending. But oh, how I wished otherwise. 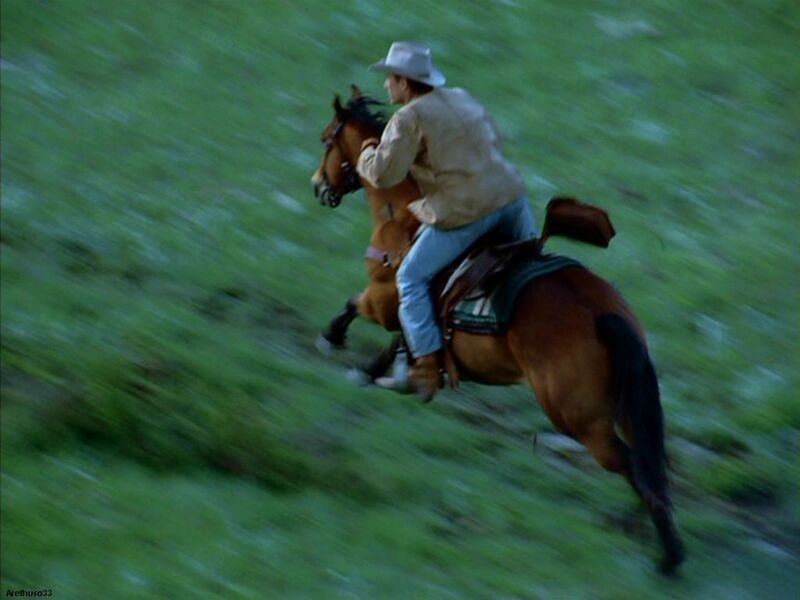 I even joined Dave Cullen's Brokeback Mountain website where alongside other like-minded fans, I could fearlessly talk about the clinging effect this film had had on me and not have anyone think I was going nuts. 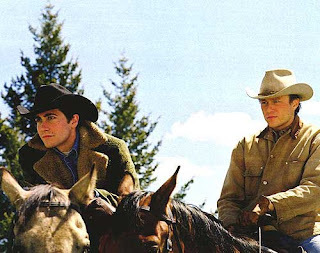 For a long time, the workings of BROKEBACK refused to leave me in peace. Something that only happens to me infrequently, thank goodness. 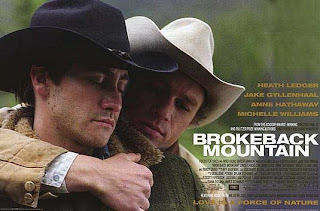 Directed by Ang Lee and scripted by Larry McMurty and Diana Ossana - all three won Oscars for their work - BROKEBACK MOUNTAIN is necessarily fleshed out from the few pages which initially appeared in The New Yorker magazine. But not, I think, to its detriment. The reclusive Annie Proulx has been quoted as saying she was satisfied with the film. It's not perfect, but I imagine it's close to the essence of what she fashioned for her two characters who, apparently, at one point took on a life of their own for her. For those of you who haven't seen BROKEBACK for whatever reason, perhaps because you're afraid of the subject matter, I say: grow up. If this isn't a film for grown-ups, I can't imagine what is. It's a love story between two men, yeah, get over it. It is a beautiful film made by a cast and crew with great and genuine respect for the original material, all artists working at the top of their game. A brilliant film. From the single almost jarring, opening chords of music by Gustavo Santoalalla (another Oscar winner) evoking the bleak loneliness of the western setting, we know we're in for something special. The camera work (by Rodrigo Prieto) and music set the initial pace. The first ten or so minutes of the film features no dialogue. The camera reveals first one scruffy, out of work ranch hand who's hitched a ride on a truck to a potential job site in the middle of nowhere - Heath Ledger's character. Then a few minutes later, he's joined by another out of work, equally scruffy, black-hatted, wannabe cowboy who drives up in a battered old truck. The two young men do not speak, but merely observe one another with some suspicion, each possibly mistaking the other as job competition. The visuals quickly establish the shy, withdrawn, uncomfortable in his own skin, personality of Ennis Del Mar (Heath Ledger). His body language and aversion to eye contact reveals all. 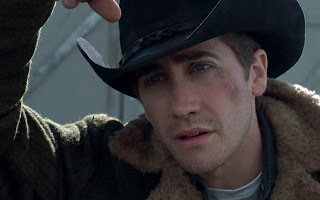 Jack Twist (Jake Gyllenhaal) is another type altogether. He appears (by his body language) a bit more assertive and self-aware, the camera lingers on his face for many seconds as director Ang Lee makes sure we notice the actor's beauty. I think it's possible that Lee is forcing us to confront the good looks of these two men, getting it over with at the very beginning so we can move on from there. Whatever his reasoning, the camera moves admiringly over Jake Gyllenhaal's face in a way calculated to make the viewer take notice. It is a stirring moment usually reserved for the female lead in a movie. It's apparent almost immediately that these two are two losers 'going nowhere', both broke and needy and probably not qualified to do much beyond hardscrabble physical labor. Though obviously curious, neither speaks to the other until after they've been 'interviewed' by Joe Aguirre (Randy Quaid), a pugnacious, over-bearing rancher who shows up late and contemptuously offers them jobs herding sheep up on Brokeback mountain, a government range. Jack and Ennis will spend part of the summer splitting duties, one staying with the herd at night, the other in daylight - in between 'cooking' and doing whatever chores are required as they move the sheep from one grassy slope to another. Necessary food, horses and dogs, supplied. Eventually, out of the blue, driven by loneliness, circumstance and the sheer lack of warmth and/or love shown to two young men while growing up, the initial spark of curiosity deepens. The two become close - each discovering in the other a mute acceptance which, obviously, they've never experienced before. It's also possible and very likely that neither has ever had a best friend. Even though Ennis has plans to marry in the Fall, I believe he's only doing what's expected in that lonely rural setting of the 1960's. What else is there for him to do - a guy with no prospects - but marry and raise a family and try to get by? It's what men do. It's all he knows. The first sexual encounter between them is instigated by Jack but Ennis quickly takes control, in keeping with what we know of their personalities. It's fairly graphic though not shockingly so - at least when compared to what is regularly shown now on cable. Their second encounter happens, after a shame-faced, embarrassed and angry Ennis tells Jack that 'this is a one shot thing.' He warns Jack that'...he's not queer.' Jack replies, 'Neither am I.' It won't be the first lie they tell each other. What neither expects, what neither accepts - at least at first - is that their lives, from that moment on, have changed forever. They both prefer, Ennis more than Jack, to believe it's all just a carnal episode which will end once the summer's over. Ennis goes off to be married leaving an obviously distraught Jack behind. Though it's made obvious at their parting that Ennis too is having a great deal of difficulty walking away. So difficult that afterwards he actually becomes physically ill. Yet neither asks the other to stay. Neither makes any gesture to force the issue. It is heartbreaking. They will not see each other for another four years. In the meantime, Ennis marries and begins a family (two daughters), according to plan, his wife Alma (played sympathetically by Michelle Williams) having no clue to Ennis's true nature. Indeed, Ennis refuses to accept his true nature, so why should she even be aware of it? They are desperately poor, living in whatever housing they can afford, Ennis taking whatever work he can find. It's a hard life. Jack, on the other hand, has had better luck. While riding bulls at a rodeo, he's captured the interest of a vivacious young woman (Anne Hathaway) who's father owns a farm machinery dealership. They marry and have a son. 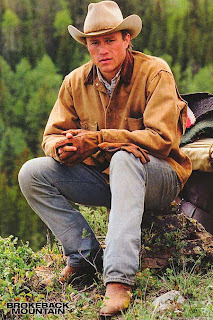 Jack gives up his rodeo-ing and goes to work for a father-in-law who has no great liking for him. It's almost as if both characters have been existing in stasis, making do, until the inevitable moment when they must meet again. Ennis, conceivably, might even have been waiting (I think he was) for Jack to get in touch. Not consciously, though. Never consciously. But we assume that each must have wondered what had happened to the other. 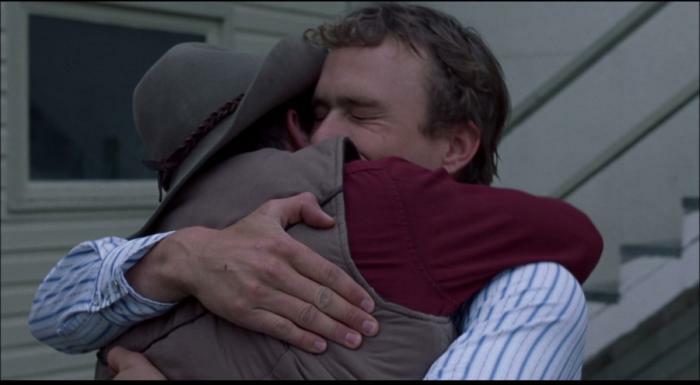 It is in those moments in the film when Ennis realizes that he is going to see Jack again that we see him show any happiness, eagerness, even joy. He stays home from work. He buys a new shirt. He is beside himself - nervously awaiting Jack's arrival. Alma assumes that Jack is just an old friend who will be having dinner with them. But once Jack arrives, Ennis quickly makes other plans. The reunion scenes are incredibly moving as Jack and Ennis immediately realize just how much they've missed each other and how desperate they've been to be together again. The acting of both Heath Ledger and Jake Gyllenhaal is equally superb. As is that of Michelle Williams, the wife who is relegated to the sidelines. The look on her face when she spots Jack and Ennis in each other's arms and cannot quite believe what she's seen, simply takes your breath away. But stubbornly she will pretend to know nothing for the few more years the marriage lasts. That is her nature. We've already seen the heightened excitement between Jack and Ennis as they make it clear that no power on earth can stop what happens next. What happens next is twenty years of misery in which Jack and Ennis go on meeting in secret once or twice a year up in the mountains - though never Brokeback ever again - because of Ennis's inchoate fear of being found out. Even when Alma finally divorces him, Ennis still refuses Jack's idea of a life together. Part of Ennis's fears stem from a childhood incident in which Ennis's father had forced him to view the torn and battered body of an old man who'd been beaten to death because he was queer. Ennis even suspected his own father might have had a hand in the murder. A horrible memory he shares only with Jack. It is this overwhelming fear of Ennis's that serves, in the end to destroy any chance of happiness he and Jack might have had. It's only when it's too late that Ennis comes to the realization of what he's lost, how he's ruined not only his, but Jack's life as well. Too late he finally understands not only how much he loved Jack but how much he, Ennis, was loved in return - when it's too late to do anything about it. "If you can't fix it, you have to stand it." A sad epitaph. This is as gut-wrenching a film as I've ever seen. It lingers in the heart and mind long after the credits role and we hear Willie Nelson's plaintive rendition of 'He Was A Friend Of Mine." I cried for half an hour. As much as I did when I read Annie Proulx's short story. I still cry if I re-watch the film, so I rarely do. But if you haven't seen it, you are missing one of the great adaptations, one of the great films of all time. A film in which everyone involved gave everything they had and by doing so, created an enduring work of art. But keep a box of tissues handy. 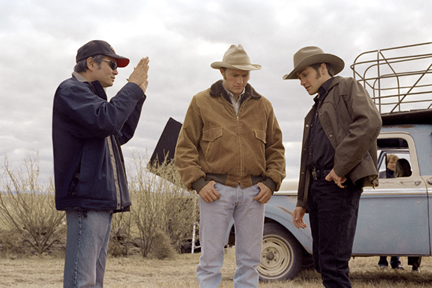 Director Ang Lee, Heath Ledger and Jake Gyllenhaal on set. 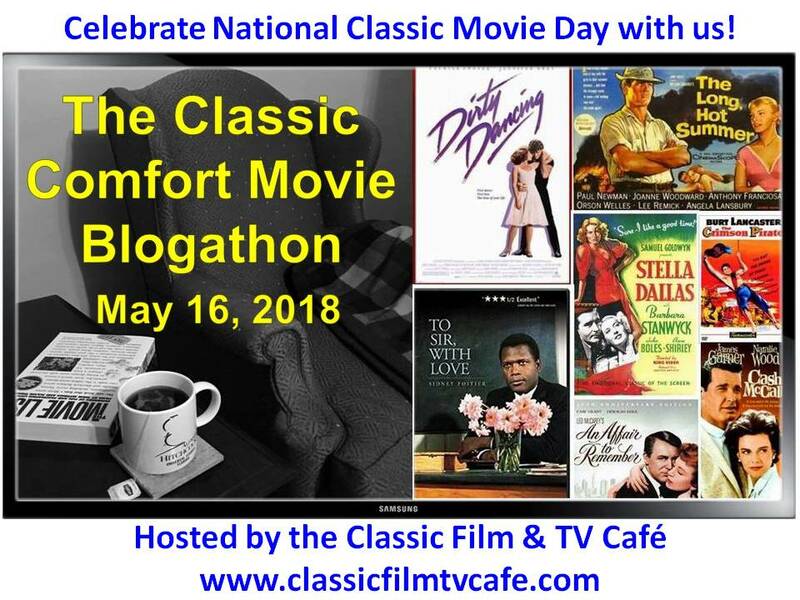 This is my delayed entry in the Queer Film Blogathon which has been going on all week with lots of movie mavens writing about how homosexuality has been expressed in films - then and now. 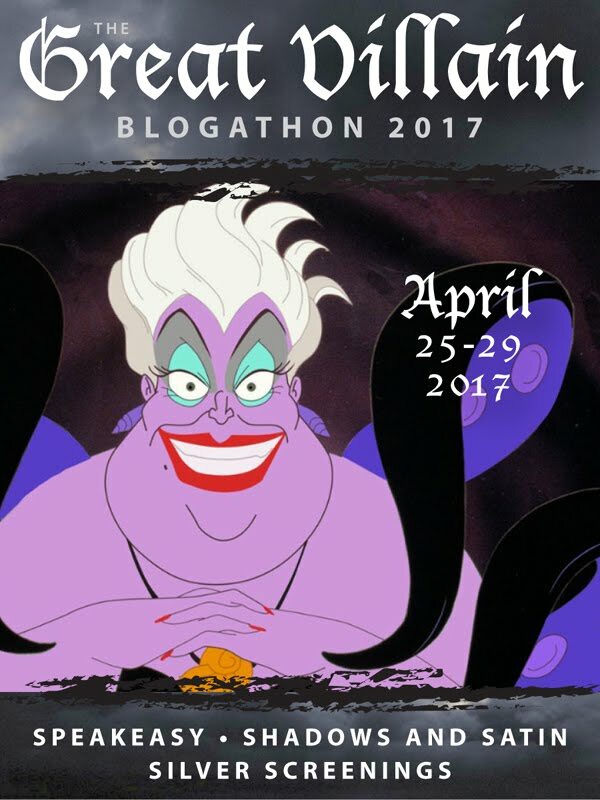 Check in at Caroline's fabulous movie blog, GARBO LAUGHS and see who else has contributed to what I hope will be a yearly event. Again I apologize for the wonky spacing and inserts. Google-blogger appears to be dragging its feet. A truly lovely review, Yvette. Ang Lee is such a gifted director, I love his work. Wow, Yvette this passionate review points out so much of the tragedy of this story that I think I didn't see the first time. Maybe I should give ti another look. I still have mixed feelings about this movie and how it was the dalring movie of 2005. As a gay man who knows the world, the secret desires, the tortured longings, the inability to openly express those feelings there is some truth to this story. Though to me it seems less a story of real love than one of sexual obsession. 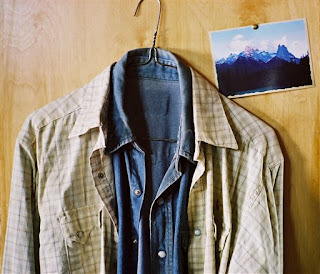 But I will admit I was deeply affected by the scene when Ledger's character goes through the clothes in the closet and finds that shirt. I sobbed at that point. Ang Lee did a remarkable job. Oh Johm, I wept. What a film. What performances. Jeez, I cried my eyes out. Wow, another fantastic, in-depth, moving movie review by Yvette. I haven't seen this movie, not because of the subject matter, but because of the tragedy. I'm crying reading this review of it, and I try to avoid such sad stories. There must be tens of thousands of love stories like this one, or more, all over the world and historically. And then so many more of people from different nationalities, communities, religions, having to hide their love. So many stories like this in film, books, in life. One movie which has a slightly different line about hidden love, but which is excellent, is The Ballad of Little Jo. There,a woman lives as a man for years to survive in the Old West, but has had a secret love affair with her Asian "housekeeper," whom she has lived with for years. She must keep her gender a secret and her affair, as the man's life would have been endangered if their romance was known. I'm so glad you're back. This is like dropping in at the neighbor's for a cup of tea and conversation. 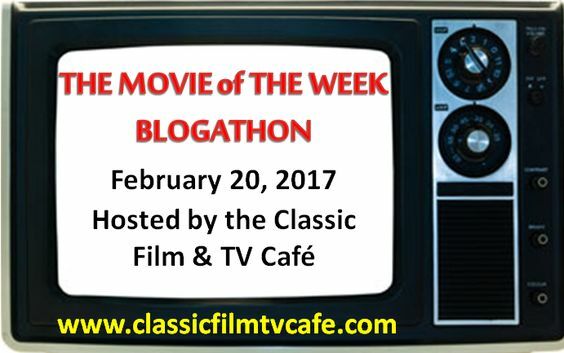 This is a film I never got around to seeing - thank you, Yvette, for such a detailed account; I shall have to make a point of viewing it! I feel that way most of the time myself. I've made a note of the movie you mention and will add it to my Netflix queue if it's available. I knew that there were women who masqueraded as men and fought in several wars. It should prove interesting. There was one, in particular, I can't remember the name, but her secret wasn't found out until she passed away and the body had to be buried. Imagine. Actually I wish I did know how to knit. But I suspect I just don't have the patience. Little Jo had to pass as a man to protect herself in rough times when women alone were in danger. Then it became needed to protect her Asian male partner. Her gender was not discovered until she died. Some people have described this movie as a "breakthrough." I have noticed though, that general audiences accept a gay-themed movie only if 1) the protagonists are vampy, comical stereotypes, or 2) one of the protagonists dies. The exeception might be "I Love You Phillip Morris," where the protagonist is locked up for life. I have to say, Mark, that I LOVE YOU PHILIP MORRIS was an unwatchable movie. Hence, I only watched about ten minutes of it - couldn't stand any more. You may be right in your theory, I would hope that in 2012, movie-viewers would be a bit more enlightened. But you never know. It would be wonderful if we could refer to BROKEBACK MOUNTAIN as a tragic love story and not have to qualify with any other word. A very touching review of a great film, Yvette, thanks very much. I wonder if the film would have made as much impact if Jack were alive in the end. You feel for Ennis because he's suddenly all alone. I thought the real story was in the ending. Ledger and Gyllenhaal were perfect as Ennis and Jack. Prahant: You've hit the nail on the head. The ending IS everything - the shirt explains (at least to me) that Jack loved Ennis from the very beginning - which only adds to the tragedy. It also is the moment (because of the shirt) that Ennis realizes the truth about the man he, admittedly, didn't know as well as he might have. HIS fault. explains much about Jack's neediness. Whoa... first tie over here thanks to your post on Ryan's site. What a beautiful telling of Brokeback Mountain. It was an incredibly powerful movie that left me in tears as well. I have never been able to re watch it. Yes, it's a difficult movie to re-watch. A masterpiece. But a cruel movie. To watch lives destroyed by hatred is not an easy thing. But I think it should be seen at least once by every grown-up. Great review Yvette, though like you, having watched it at the cinema when it came out, I have yet to sit and watch it all the way through again on TV - just too sad. Really enjoyed reading abotu it though. Thanks, Sergio. I know what you mean. Prashant "lured" me over here with the link in his blog today. I saw this film once and probably could not sit through it again, for the simple reason that it is so gut-wrenching. It has to strike a deep chord with anyone who has some of Ennis in them--the self denial, isolation, and fear of intimacy for whatever reason. I believe that for men, a lot of homophobia is that fear of intimacy, not so much because it's socially frowned on between men, but because of the vulnerability it requires in a relationship with either another man or a woman. That's not a risk most men are willing to take. 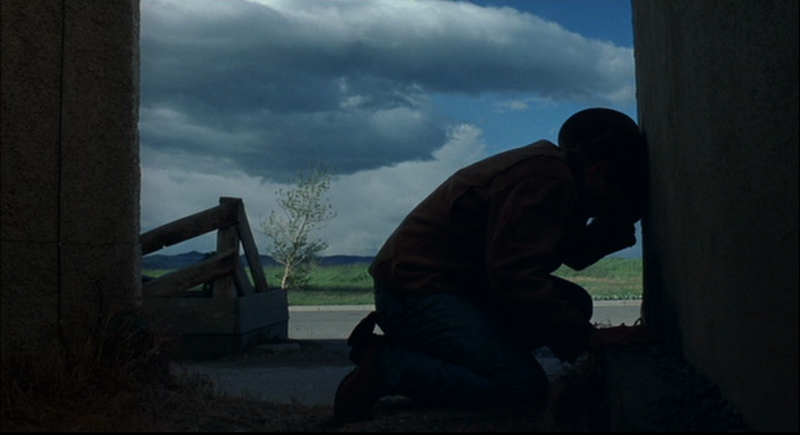 In that respect, the coda that the film adds to Proulx' story saves it from being a total tragedy. Ennis agrees to come out of his self-imposed shell and accept his daughter's invitation to her wedding. The two shirts, by the way, have been up at the Autry Museum in Los Angeles. Maybe still are. Keep the faith. You're doing fine. Hi Ron, I think we agree on nearly everything re: this movie. 'Fear of intimacy' is, perhaps, part and parcel of being a man. I don't know why it would be, but it wouldn't surprise me. The men I know would probably deny it to the death. But I think also quite a few men were afraid of this movie because of the silly thought that maybe, somehow - it would turn them gay. I kid you not. There are a lot of wild theories out there. I love this movie. I've only seen it once becuase it does make me so sad at the wasted opportunites and life. it's a lot like what I call "classic" gay literature. There is rarely a happy ending. I don't think happy endings should hapeen everytime, but it's nice to have one every once in a while. But maybe those that don't serve as a reminder of horrible things can go and to appreciate what we do have. Yvette...the movie is now showing on Showtime. I have not watched for years but am now able to have the feelings I did when the film first premiered. The tears still flow but the beauty of this film is forever.